September 22, 2015 — St. Johns, Antigua (Press Release) – Another round of SnG Battles has just begun at Intertops Poker and Juicy Stakes Poker. 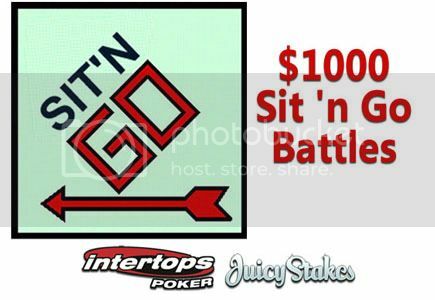 ; Players at the top of the Sit n Go leaderboard this week (September 22 – 28) will split $1000 in prize money. Another $1000 will be awarded to the top players September 29 to October 5. Players can join these SnG Battles simply by taking a seat at any SnG game listed in the poker rooms (excluding double-up, kamikaze and satellite Sit & Go games). Playing at tables with higher buy-ins earns more points than at lower buy-in tables. Winning, or coming close, also adds points and improves rankings. The weekly prize money will be split between players in SnGs with a buy-in of up to $5 and between $5 and $10. Each week, the top 30 players in each category will receive cash prizes every Monday. Players at these two top Revolution Poker Network sites have one more chance to win their way to a live poker tournament in Punta Cana. A final online satellite tournament series began this week and will award a $4000 prize package to the champion on October 4. Players can buy-in at any point in the 3-tier tournament. Step 1 tournaments ($2.00 + $.20) are held daily at 14:00, 17:00, 20:00, 23:00 and 02:00 GMT. The champion will win a prize package sending them to the CPT Punta Cana in November along with 5 other previous tournament winners who will all be sharing their experience in the Caribbean on the Living the Dream poker blog (http://www.live-dream.poker.blogspot.com). In addition to busy poker tables with players at every skill level, Juicy Stakes and Intertops Poker also offer dozens of online casino games from Cake Gaming. Check out our Online Poker site for more.